Annual eye exams are important for EVERY Picard, so that owners and breeders have an idea of what really is happening with their dogs’ eyes, and as a group we have an idea of what’s going on in the breed overall. A clinical ophthalmologic exam will only tell the clinical status of that individual dog on the day of the exam – it cannot tell if the dog will develop a problem in the future, and it cannot tell if a dog is an asymptomatic carrier of an inherited eye disease. However, when a dog is diagnosed as affected with one of the diseases known in Picards, the parents must be assumed to be carriers. When clinically normal dogs produce affected offspring, it strongly suggests the disease is inherited as a simple recessive (or potentially a polygenic – multiple gene) trait, and both parents carry one “bad” copy of the gene causing the disease. At present, there are no DNA tests to determine genetic status for eye diseases in Picards, but research is underway at the University of Missouri. PRA (progressive retinal atrophy – roughly equivalent to macular degeneration in humans) is present in this breed, and probably we have at least 2 forms of PRA – one an earlier onset, with clinical signs beginning to appear at about 3-4 years of age, and a late onset form with clinical signs appearing at 8-9 years of age. PRA is an inherited condition where the cells of the retina deteriorate causing blindness. Although not painful, both eyes are affected. The first sign of PRA is decreased night vision. Your dog may become more reluctant to go out after dark or become disoriented in low light situations. This is a degenerative disease with no cure. However, there are some antioxidant supplements available that may slow the deterioration of your dog’s sight. Researchers at U of MO have looked at several known PRA mutations, and so far the Picards diagnosed with PRA do not have these known mutations. CMR (canine multifocal retinopathy-roughly equivalent to Best disease in humans) – does not appear to progress to complete blindness in Picards as it does in other breeds where it is known (Great Pyrenees, Coton de Tulear), but it probably does impair vision somewhat. Picards do not have a mutation in the gene that is responsible for CMR in these other breeds. Distichiasis- a condition where the eyelashes grow in the wrong direction. Some signs that your dog may be experiencing vision loss or blindness include general clumsiness, bumping into walls and furniture, startling easily and apprehensive behavior, inability to find toys or food and water bowls, reluctance to go out at night, excessive sleeping or loss of playfulness, disorientation or confusion, or changes in the appearance of the eyes. If you notice these behaviors in your dog, you should seek immediate veterinary care. It is important to see the same ophthalmologist if possible for each exam and bring photocopies of previous exams for ease of reference for the examining veterinarian. This is the best way to track changes in individual dogs. 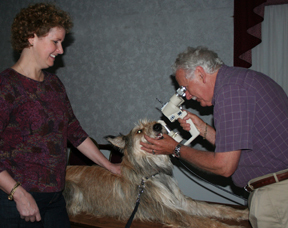 Many dog shows offer eye exams so check the premium lists. When considering a puppy, DO NOT purchase a puppy whose parents are not on OFA or CERF database. The results should also be current… not several years old. If the breeder has not spent the $15 to have the results posted on a verifiable database then one may conclude, either they have not tested their dogs or they do not want to post a failing result.